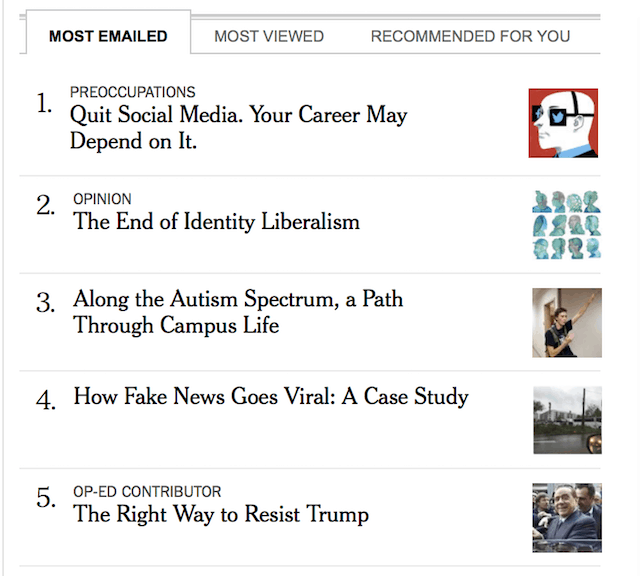 On Sunday, I published an op-ed in the New York Times arguing that social media can cause more harm than good for your career. The core of my argument is that the professional benefits of social media are being overemphasized (I don’t buy this idea that suddenly Twitter and Facebook are the main channels through which talent is recognized and opportunities spread), while the professional costs of social media are being underemphasized (see: Deep Work). As indicated in the above screenshot, this generated some discussion. I think it’s worth me taking the time to clarify my thinking on this issue. When I’m speaking negatively about “social media,” I’m almost always referring to the major services offered by the major attention economy conglomerates; Twitter, Facebook, etc. These companies, like any media company, harvest your time and attention and transform it into revenue. This is a lucrative industry, so they invest a large amount of resources into making their services as addictive as possible. The ideal use case for these companies is that you return persistently to their services throughout most of your waking hours (c.f., Jim Clark talking about a social media panel where a panelist was raving about the growing number of users spending 12+ hours a day on Facebook). Contrary to some recent strains of thinking, I don’t think these companies are doing anything unethical, much in the same way I wouldn’t condemn a television network for trying to produce the most watchable possible programming. But a side effect of this addictiveness is that it can cripple your ability to perform deep work, which, as you know, I think could have disastrous consequences for both your professional success and personal fulfillment. This definition of “social media” is quite narrow. It doesn’t include, for example, individual blogs, or discussion forums, or homegrown sites like Hacker News — as these services haven’t been massively optimized to colonize our cognitive landscape. 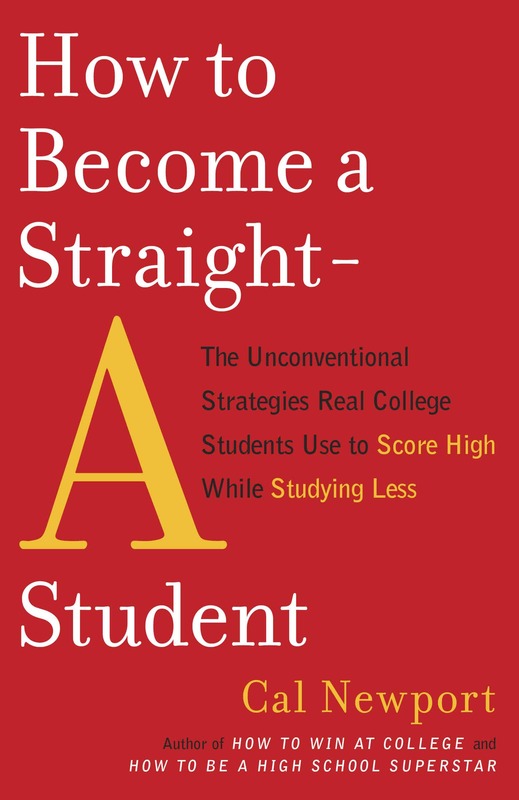 I know many people who are dismayed about how much time they spend checking Facebook, but (to my secret disappointment) I’ve never met someone whose claimed the same about Study Hacks. In other words: I like the Internet and I like its potential to connect, energize, and inform people (while also recognizing, of course, its scary potential to misinform and divide on a mass scale). But I’m wary of the small number of services that have conquered our culture by claiming to be synonymous with these goals while in reality plotting to squeeze every last cent of value out of our scarce attention. I use feedly and am addicted to that. But the websites I follow are mostly related to learning more for my job, and also to become a better leader / communicator (hence following this site). But by following so many blogs, I read less books. Thank you so, so much for the piece you wrote in the New York Times on the overemphasis placed on social media’s ability to lead to career opportunities. I agree that social media is more an addictive distraction than anything else. I was so happy when I deactivated my Facebook account several years ago. It felt so liberating to no longer be on Facebook! Later on, I reluctantly opened LinkedIn & Twitter accounts because I felt I had to for professional reasons. Neither of those social media accounts has significantly benefited my career yet. Anyway, while I will keep these accounts, I won’t be spending as much time using them to “help” with my career. I think it really comes down to moderation. Most of the average FB feed is trash and filled with nothing that will make your day more productive. However, I still keep mine active and check back into it every so often just to see if I end up seeing something worth seeing from family and friends. Linkedin is another site that won’t help you greatly professionally but there are tools in there that can help search for leads that relate to your market but it’s at a monthly. cost. I spend more time on Study Hacks than Facebook or Twitter. I don’t use either of those services. But, I don’t have to keep checking Study Hacks, you send me an email when you post something new. Kudos. Right on. Only social site I use regularly is ResearchGate. What is the alternative to what you’re proposing (i.e. quitting social media)? Personally, I find that the majority of people use Facebook more than their email, so I feel almost “forced” to use the social media site to connect with friends and family both individually and as a group. I find the website useful in creating events to send out details to a group of people, to keep each other updated on resources, share new information, or work on a group project together, as I am still in college. To restate my question, what are suggestions you have to fill the void (services) that people find useful in these social media websites; reasons for use can include self-expression, sharing news for the purpose of social justice or providing resources, mass communication, and event planning? @Erika – There is no alternative. You will have voids. Facebook has its uses. The problem is that the bad often outweighs the good. The extra connections you make are often not worth the habit of interruption on your brain, or the well-studied depressive side effects of social media, etc. You’ve taken the things you find Facebook useful for and decided you need these things in your life, probably at the cost of building your career (right now, academics and internships are your career), having deeper connections (over a smattering of shallow ones), or even the sanctity of your mind (again, go google “facebook depression”). Great piece Cal and the chapters on this in the book had me nodding my head again and again. Technology isn’t necessarily the problem, how most of us use it is. One of the major recommendations in leadership material is to track your time. We track it because we really don’t know where it goes. Three to four weeks of tracking the number of times we check social media (distraction) along with the amount of time actually spent on those sites should be insightful and potentially provide motivation for change. Would this post qualify as a humble brag? Thanks for the article, Cal. I don’t think your blog post is a humble brag because 1) it merely stated the facts about the ranking and 2) brought the article to nonNYT subscribers’ attention. Two widely accepted utilities of the internet are 1) content (which all study hacks readers especially value) and 2) platform capabilities (which basically equate to how can we help readers help each other). I think all would agree that there’s a point at which the use of the internet impedes our productivity and that’s on an individually defined curve. I like your public health approach to the attentional crisis we’re facing. Congrats, Cal, on the successful op-ed. Austin Kleon raised an objection to your piece that I think is worth exploring. To wit, does your position in a university allow you to reject social media in a way that other professions cannot? Kleon mentions in a recent newsletter that “[you teach] at a university, an institution which already has built-in networks of support, fellowship, and feedback.” Furthermore, that for those outside of places with this built-in structure, social media can provide *some* value. I wonder, then, how you and others think about whether you can universalize your experiences or if there might be some limit based on our varying circumstances. I’m not entirely convinced by Kleon’s objections, nor do I think you’ve hit the ball square on. I think that tension is useful to a reader like me — so keep thinking out loud! Fair point about teaching at a university, where there are built in feedback structures, etc. That said, query whether putting frivolous Facebook posts and tweets is really a useful tool to build a real network, get valuable professional feedback, etc. I heard Cal Newport on The Federalist Radio Hour and immediately downloaded Deep Work. The book is fascinating and accurate. Moving through the book to the Social Media Rules I examined my FB behavior, concluded it was an addiction, did exactly what was prescribed and got almost immediate results. More time in the day to pursue the guitar – doing my first open Mic night in 2 days. Recertifying in Infection Control, a meaningful endeavor that will bring value to my career. No one is too old to benefit from the Rules. Yes. We all need a cabins in the woods. Time off the grid. Ideally out of cell phone service altogether (I have tethering, which lends a poor to nonexistent wi-gi signal useless). I’d like to thank you for sharing your thoughts. 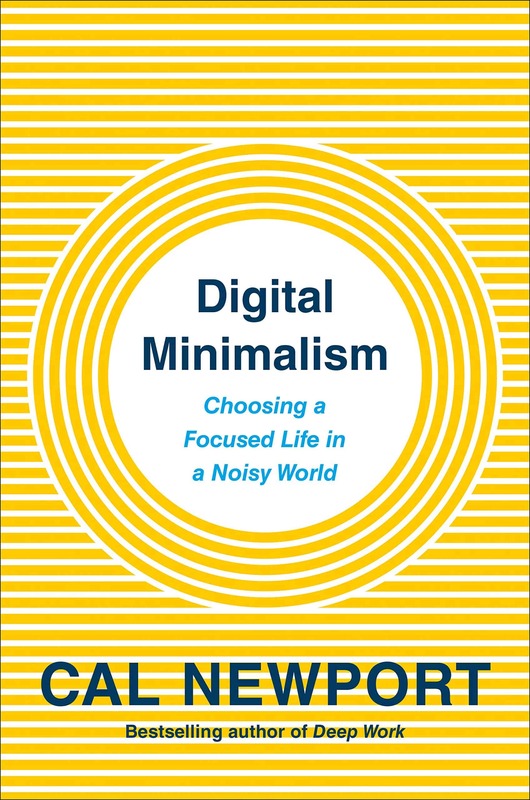 Your blog and your book on Deep Work came to my attention by reading your recent article on the New York Times. I ordered the book on the same day and I am close to the conclusion – around 50 pages left. I switched off my Facebook account – as a few times I did in the past, without any success – and I am gathering an incredible amount of information on the topic, by nurturing my ability to think in a critical way, independently, and without too many distractions. My comments are not aimed at receiving a “well done!”, as I believe I have to rebuild my schedule and routine from scratch. I usually write articles for my students community and I deeply enjoy to receive the feedback of those who read me. This is why I would like to simply let you know that you are contributing in making others’ lives better. I avoided social media like the plague during the entire election cycle. I don’t watch TV and I listened to NPR during my commute to work. Needless to say, I was severely ill prepared for the turn out of this election and turned to social media to connect with others on wth just happened. I’ve followed all sorts of organizations and political figures on both sides through social media and I believe I’ve developed a different set of lens on the world than I would have via mainstream news. However, the more I observe the dialogue and how people treat each other on social media, the more I want to go back to my ignorant bubble prior to the election. I honestly want to de-activate all my social media apps immediately, but also don’t want to lose the insight I have gained by observing social network behaviors and connections particularly with government officials. So my question to you is how do I continue to stay well informed on the issues that are facing our world without any political biases in addition to reading articles from the New York Times, WSJ, or The Economist? Watch CSPAN? Please help. Thank you. Thanks for posting this. As a parent, I’m a big fan of yours and your study hacks have been invaluable. When I read the Times article I wondered if one of the best blogger’s in the world was renouncing the medium. Glad to hear you endorse P2P approaches. I’m not sure if you’ve read Mike Caulfield’s work in this area (https://hapgood.us/) but he’s thought very deeply about limitations with the blog and wiki models. Some of the key concepts he’s working with are “federation” and “connected copies.” This area cries out for someone with deep knowledge of distributed systems. I’d love to see you take some of your CS knowledge and apply this to “learning networks.” Just my two cents. Cal, I tend to take your side on this issue, but I’d be interested to hear more in the way of responses to those who disagree with you. For instance, the writer/artist (and NYT Best-Seller) Austin Kleon has claimed that your advice re: social-media is only pertinent to those who have access to clear avenues of advancement (professors, company workers, etc. ), and not to those whose work is more artistic in nature (see https://twitter.com/austinkleon/status/800334622940770304?lang=en). What reply, if any, would you have for such critics? Again, I tend to favor your side, but am curious as to how best to approach such claims. If you want an answer to critics you have to first ask them what their prize is? Actually you have to ask Cal this same question. All devolve into a debate about what method is better without anyone actually defining what the end “desired” product is. I argue this is true even in Cal’s case, what is deep work exactly Cal? Or why would someone desire it? Now I know what deep work is and why I want it. The thrill and awe/ecstasy you get from tackling a difficult subject like biotechnology (me) or computer science (Cal), and then finally having discovered the right perspective that allows you true understanding isn’t something a lot of people understand. But that of course is an academic “desired” end point of deep work. Each trade has their own deep work version. The issue is that a lot of these critics who counter are actually seeking a different “desired” end product. They want fame or prestige. They want the large follower numbers, they want to be known by everyone for no other reason that they do. Some just want to get large numbers so that 1% of that “mailing list” or network can be converted into revenue or sales of their product or art. None of these reasons are wrong. 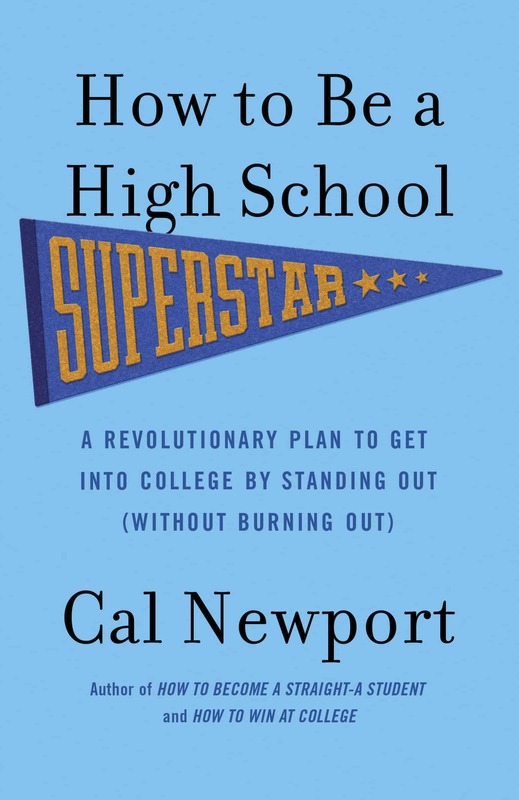 Cal on the other hand does have to accept that he enjoys the current fruits of his labor (being an academic with a job that pays him to think and research), thus allowing him to create a feedback loop that makes it possible for him to get even better in his deep work and thus create more opportunities. He himself says this in the NYTimes post; he receives way more offers than he can handle. This is amazing, and kudos to him for being the 1% of 1% of students who actually get a professorship today. The odds of getting this job by the way are very slim to none. Just ask all the post-docs who want to be professors. The vast majority of students on the other hand won’t get a job that they will retire from. They won’t get the opportunity to do deep work because they will have to go into a different company in a different industry to get a higher pay. So they have to keep learning new skills to work and earn a living. They’ll do this a few times in their career. That is to say, by the time the vast majority of current students get into a position like that of Cal, where they can create the feedback loop to become amazing craftsmen/women in their trades they’ll be close to retirement. Those that are critics of Cal’s talk are so because they are the ones trying to create a job or find one that allows them to do what Cal is saying. But trying to deepen your skills, while being unemployed is very difficult. I believe this to be the reality of life today for the young. I’m sorry to anyone who is older than say 35, but the fact is my life experiences only give me the knowledge of what it’s like to be a young person like myself. I also do understand that I enjoy many amazing benefits, being in N.A. (in the top 1% of the global world), but Cal is talking from a place of privilege that many in our generation don’t have. I wish he would recognize this. He is as I already mentioned, in the 1% of 1% of students who get such a position. I mean if he stopped writing altogether now on this blog and on the topic of deep work, and did nothing but academic research and publish, he’d probably have an amazing career. Unlike most researchers he is interested in not only doing better work, but doing it in more effective ways, and that gives him a leg up on his colleagues even. Sorry if this went for too long. This is a great point which I hadn’t considered before. 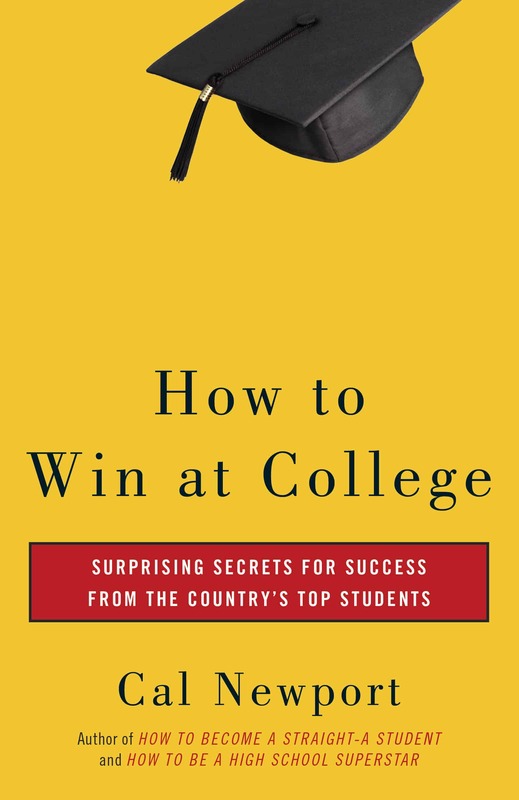 However…It’s not like Cal is in a privileged position because he won the academic lottery. No, it’s because he’s been eschewing pointless distractions (social media) for his entire adult life. As for writers/artists needing to use social media in order to get ahead: that is bogus. First, achieving any kind of financial success in the arts is difficult. It doesn’t necessarily follow that having profiles on the big websites will do an artist any good, because for every creative type who claims that Twitter is working for them, I can think of one avoids it and still gets lucrative work because of–you guessed it–a sterling reputation based upon artistic achievement (and professionalism, like being courteous and turning in projects on time). Secondly, all the time that an artist fritters away on these services could be better spent honing craft, meditating, exercising, strategizing . . . Some people think of social media as tools but, like another commenter said, they are not worth what is being given up. A hammer is a tool but a hammer isn’t designed to get you addicted to using it all throughout the day. What’s a big network matter when there’s a shallow body of work behind it? That’s a false equivalency, I know, and it’s not really fair, but this is in fact a zero-sum game. The time spent on Twitter can’t be spent on something better later on: it’s just wasted. Lucrative projects, opportunities, and acclaim all follow great work, so why not spend more time learning how to do that? Something remarkable? That’s my worthless opinion and your results may vary, of course. There are plenty of hot young things fetching modeling contracts based on their Instagram accounts…and for everyone of those, there are countless narcissistic aspirants. Ah, life. So unfair. Fantastic, as usual Cal. The way people focus on exceptions to the rule is a distraction to your real issue – the VAST majority of people derive little tangible benefit from social media regardless of the smattering of success stories. Along the lines of “any given benefit” vs. the potential significant drawbacks. Aside from these exceptions, I rarely see any substance to the “but but… it is important for me!” argument. I’d love to see a tangible and significant example (or series of examples that aren’t exceptions). Poetically, a lot of misinformed commentary about your article is on social media itself, those defending social media – which in itself is a case in point (i.e. I don’t see how arguing this with each other is helping one’s career!). Pingback: The millennial who deleted all of his social media (that’s me) | Outbound. I think there is no problem in keep social media, if you schedule time for it. If i separate one hour a day, at the end of the day, to check my facebook, twitter and instagram, i won’t compromise my deep focus hability.